Removable Glue Dots are non-toxic and acid free. 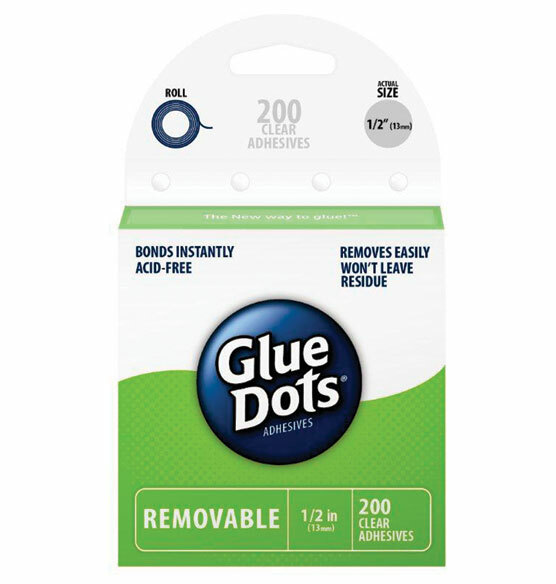 These double-sided adhesive dots form a strong, instant bond, but can be removed at any time from any clean, dry surface. They are mess free, remove cleanly, and won’t damage most surfaces. Because you never get enough dots with the regular order. I've used these to hold my photos in place on the Three-Ring Binder Ivory Sheet Protectors and they work great! The pictures stay in place but the glue dots can be removed easily if need be. To keep my photos in place. Excellent - these work great. Dots hold the photos in place, and I'm using for photos 60 - 100 years old on Exposures archival photo pages. The dots can be removed, if necessary, and are a very clean way to attach photos. Have never tried it. I want to see if it works as well as double-sided tape. I find there useful when mounting when mounting pictures in an album. Easy to use and holds photos firmly. won't chooce again. Did not work out well. Being able to reposition photos will be helpful. doing clients photo albums is part of my business. The glue dots make it so easy adhere photos on and off a page. Their awesome! I have chosen these because they do not harm the photos, are easily placed, and easy to remove if necessary. I wanted to try them out. Easy and fast to use. They are wonderful!!!!! Looked like a safe, easy option for attaching photos and/or documents to the mylar pages. Acid free and archival feature very important to me. this is very handy to attach photo without damage. Like that they are removable and not too expensive. I have used these glue dots for many years and are easy to apply and they are strong - holding the photos well. Great item for my picture project! I like the option that the dots can be removed and are not necessarily permanent. Needed adhesive to stick pictures to album. These are removable and acid free. I like to be able to adjust photos if I need to after they've been placed on a page. The only product to use for photos that does not damage the photo. An excellent solution for mounting photos. BEST ANSWER: We use them istead of glue to secure photos in albums, scrapbooks, collages. My kids have used them to temporarily hold figures in place on dioramas. What’s nice is that they are removable and don’t leave marks or debris on the back of papers, etc. They are sometimes used in magazines to keep inserts in place. I bought them to use in a keepsake photo album, but my children use them more than I. They are used to mount photos in albums. I mount 4X6 photos and 1 glue dot in the center doesn’t hold the photo in place straight. They are large so I cut them in 2 pieces. It isn’t easy and clean but I dont know how to get around it. I use them to easily put pictures and other items in scrapbooks. Easy to unstick and rearrange items. Love them! If attached to cardboard, will dot tear some away upon removal? BEST ANSWER: I haven’t experienced that. We used them to secure animals on a jungle diorama, and we shifted them around without damaging the base. Potential for damage is much less than if we used tape and most certainly glue. Thank you for your question. The removable glue dots are used for photos and photo albums, it is not suggested to be used on cardboard. We hope this information will be of help to you. when are glue dots available? BEST ANSWER: Thank you for your question. Unfortunately we do not have an in stock date form the supplier. We suggest checking back on the website every 1-2 weeks. We hope this information will be of help to you.